AP-250 converts ordinary water to "Pi Water". By it's natural power, AP-250 adds extra features to regular water. prove you how effective Pi Water is. Pi water brings you great health in many ways. 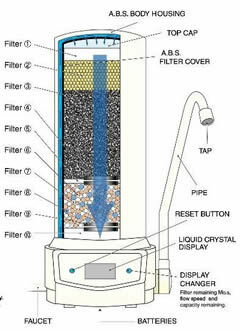 It filters harmful substances such as: pollutants, rust and other impurities. Removes Chlorine, tri-halomethanes and chloramines. Also deodorizes and improves the taste of water. Regulate ions in water and change it into fluid magnetic-water. Then, water clusters into smaller ones for a better tasting water. Creates from natural stones with rich minerals. Small amounts of minerals and far-infrared rays are released from ceramics. Has a positive effect on the body. Changes regular water into BODILY LIQUID (Living body water). Like water, it gives you energy and vitality to the body. It also creates anti-oxidation effect that has a stronger surface tension. Negative ions (anions) in the stone improves the ability of the body for natural healing and immunity. They also enhance the exchange of substances in the blood and increases the metabolism.